Major companies registered for a business conference in Saudi Arabia next week still plan to attend, despite growing pressure for a boycott. Senior executives from firms including Goldman Sachs, Pepsi, Thales and EDF are expected to be there, along with US Treasury Secretary Steve Mnuchin. The event was set to feature 150 speakers from 140 organisations. But at least 30 delegates have dropped out since the disappearance of Saudi journalist Jamal Khashoggi. A critic of the government and a columnist for the Washington Post, Mr Khashoggi vanished on 2 October after visiting the Saudi consulate in Istanbul. Turkish authorities say he was killed in the building by Saudi agents, but Saudi Arabia has dismissed the accusations as “lies”. Consultancy firms McKinsey, PWC, Ernst & Young, Deloitte, BCG, Oliver Wyman, and Bain & Company are all sponsors of the event, along with German conglomerate Siemens and research company SWFI. None responded to questions about whether or not they had plans to withdraw. Germany consultancy firm Roland Berger, which is also sponsoring the event, said it was reviewing its position. The BBC understands that Goldman will be sending a small number of attendees. However a page with a list of confirmed speakers has been removed from the conference’s website. Dubbed the “Davos of the Desert,” the three-day event is organised by Saudi Arabia’s sovereign wealth fund and is an opportunity for firms to build relationships and secure lucrative contracts in the Kingdom. Politicians and business executives from Europe, North America and Asia were on the attendance list. US Secretary of State Mike Pompeo travelled to Riyadh on Tuesday for talks with Saudi Arabia’s King Salman and Crown Prince Mohammed bin Salman, who he said “strongly denied” any involvement in the disappearance of Mr. Khashoggi. 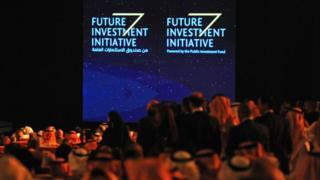 But dozens of firms have now shunned the Saudi business event in protest. At least 30 high-profile speakers have withdrawn so far from organisations including HSBC, Uber and the International Monetary Fund. Sir Richard Branson has also halted talks over a $1bn (£756m) Saudi investment in Virgin space firms. UK International Trade Minister Liam Fox is “reviewing his decision” over whether to attend, according to a spokesperson for the Department for International Trade. Angus MacNeil MP, Chair of the International Trade Select Committee expressed his support for further boycotts. Human rights charity Amnesty International has also said businesses should “think twice” about attending. Businesses should consider that it might damage their brands to be associated with a country that “bombs civilian targets in Yemen, imprisons human rights defenders and apparently disappears a journalist overseas”, said Amnesty’s Economic Affairs Programme Director Peter Frankental. However a spokesperson for the Confederation of British Industry (CBI) said it was up to individual companies to “look at the situation carefully and make their own judgments”.